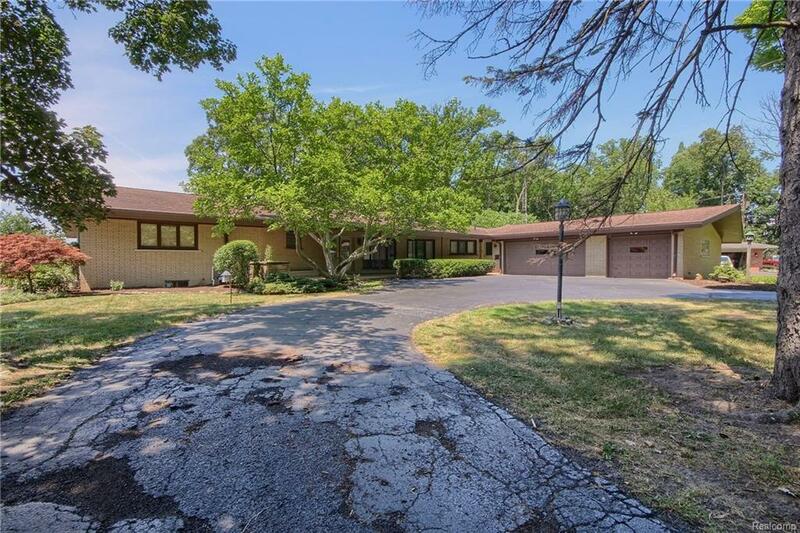 Great large mid century modern ranch located on the 12th green of the Grosse Ile Golf and Country Club. Beautiful wooded lot with nice set back from the road. Updated kitchen with all appliances included. Remodeled bathrooms with ceramic and marble and walk-in shower. 2 cedar closets off hallway. 3 fireplaces. Open concept living room with dining room attached with beautiful views of golf course. Family room with cathedral ceilings and fireplace overlooking golf course. 3 large bedrooms with nice size closets. Finished basement with wet bar and fireplace is great for entertaining. Basement has been waterproofed with transferable warranty. 2 furnaces. 2 central air conditioners. 3 car attached garage. Circular driveway and ample outdoor lighting. Nicely landscaped. Exclude dining room chandelier. No virtual showings.